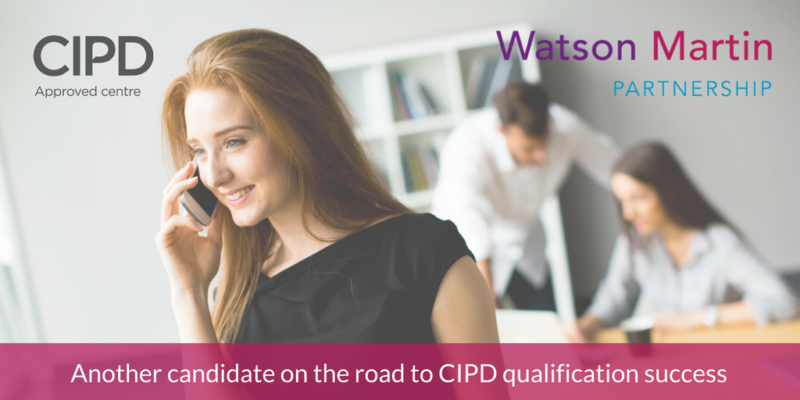 Thinking about getting CIPD qualified but not sure which level to go for then Watson Martin Partnership can help … Deciding which CIPD qualification to sign up for can be a confusing business. With qualifications available at Foundation, Intermediate and Advanced levels and a choice of awards, certificates or diplomas on offer plus a range of study options, the choice can be overwhelming. Which is where Watson Martin Partnership can help. We have a dedicated team of experienced advisers who can discuss your qualification and schedule in a 30 minute no-obligation diagnostic session to help you decide. Choosing the Foundation Diploma was definitely the right decision for Heather, an HR Administrator who approached Watson Martin Partnership in March last year for advice on getting qualified. Now, almost a year on and about to complete the Foundation Diploma in record time, Heather believes it was the right choice. I did consider the Intermediate qualification but I felt I wasn’t quite there yet and the practical skills developed at Foundation level were more suited to my current role,” she explains. It was an online careers psychometric test at university which first sparked Heather’s interest in HR and after completing her degree, she started applying for graduate positions. She has been in her current job for three years and, having started with no HR experience, she now feels confident enough to make decisions and achieve her potential in the role. Heather says. “When I started in the job I had no knowledge of HR and so it has been quite a steep learning curve. Luckily I have a manager who is very supportive and as well as providing on the job training, she has encouraged my personal development through the CIPD programme. Having had experience in the role and through the Foundation qualification, I now have a good understanding of how a business operates, its functions and values, and the background and purpose of HR. I can comfortably and confidently explain why HR is an important function in any business. “My adviser, Michelle McLaughlin has also been very supportive and, during the course of the programme, has given me constructive feedback on how to improve going forward and praising me when I have done good work which as a student is encouraging,” she adds. Juggling work and study can be tricky and Heather ensured she made time for learning by dedicating specific weekends to read around the modules. She is also a self-motivator so with an understanding manager and an accessible adviser she has found the studying very manageable. I haven’t ruled it out but I would like to give myself a break first”, she laughs.